Since time immemorial, peaceful people have engaged in trade and carried their merchandise extended distances over land on horseback and camels as well as by river and sea using a variety of watercraft. By the early 20th century, the practice of merchants owning and operating their own boats had largely disappeared and most international marine cargo was carried aboard large boats owned by shipping companies. However, government interference in the economy during the early 1920s, which led to the stock market crash of 1929 and the Great Depression that followed, also caused a resurgence of merchants owning and operating their own boats. Since 1920, the United States government had been enforcing a prohibition on alcohol for reasons of public morality. Many men who lost their jobs as a result of government interference in the economy, or were unable to cope with the challenges of living through the Great Depression, sought escape through intoxication. This only further fed the bootlegging trade in alcoholic drink. Entrepreneurs could purchase a consignment of alcoholic drink in Mexico, Canada or the Caribbean Islands and transport the product on their own boats to discrete American coastal locations. The demand for alcoholic beverages across the USA during the prohibition era attracted entrepreneurial types who were eager to meet the demand of the market. Government officers were only able to intercept a small amount of the import trade in alcoholic beverages. The lesson of prohibition is that as long as there is a sizeable market demand for a prohibited product, entrepreneurs become more ingenious in how they produce the product and deliver it to market. Prohibition reduces supply for a product that is in demand and therefore raises its price. The prospect of high earnings and massive profits in a restricted market provides incentive for entrepreneurs to perform at far higher levels than entrepreneurs who provide goods and services to the open market. The exchange between entrepreneurs and their cash-only customers is mostly peaceful and mainly private. Only unwise customers incur debts with their suppliers. Participation in a restricted market requires very capable, very competent, very ingenious and often ruthless entrepreneurs who are willing to live by the law of the jungle. The spectacle of gangland gunfights that prevailed on the streets of Chicago and New York City during the prohibition era was how rival entrepreneurs sought to resolve their disputes. An extreme version of that spectacle now occurs just south of the US/Mexico border. The mayhem may involve rival gangs or clashes between gangs and various government agencies. The United States represents a major market for a wide variety of prohibited products. As long as there is a large demand for such products, there will be entrepreneurs willing to supply the demand. The prospect of high earnings attracts some entrepreneurs while the thrill of going up against challenging odds attracts others. "As long as there is a large demand for such products, there will be entrepreneurs willing to supply the demand. The prospect of high earnings attracts some entrepreneurs while the thrill of going up against challenging odds attracts others." The latter group may be compared to computer gamers who experience a sense of exhilaration, success, accomplishment and a heightened sense of personal worth when they achieve a simulated victory. They actively seek computer games that provide greater challenges. Computer games often encourage strategic thinking and it may be possible to transfer such thinking to other, real-life endeavours that involve major obstacles in the course of "delivering a message to Garcia!" The message may be a prohibited product and Garcia may be any of its many eager customers. Sometimes the person who delivers the message to Garcia may get caught, as recently occurred along the American Pacific Coast when a Coast Guard vessel caught a small submarine. It was the first time that such a vessel had been intercepted and it had been able to avoid being detected. The submarine carried no weapons, only a load of merchandise destined for customers across the USA. Some estimates suggest that there may be some 90 such submarines operating along the Pacific coast between Latin America and the USA. 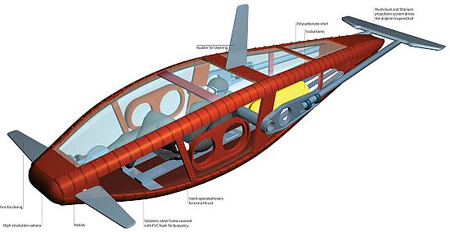 The capture of 1 out of a possible 90 submarines indicates the level ingenuity of the entrepreneurs who seek to deliver their products to their customers. The existence of the trade submarine indicates that some entrepreneurs prefer to engage in peaceful and profitable trade, rather than engage in conflict. Law enforcement officers have often admitted that despite their best efforts, they're progressively intercepting a smaller and smaller percentage of the prohibited trade. This suggests that the ingenuity of the entrepreneurs is achieving greater success. The economy of the USA has experienced a very major slump with job losses across the private sectors. An estimated 1000 janitors in the USA may hold doctorate level university degrees, with some 100,000 waiters and waitresses plus some 300,000 parking lot attendants holding college degrees. There are thousands of educated young people across the Americas who are either unemployed or underemployed. Prohibition provides opportunities galore for entrepreneurial types to develop ingenious contributions in the areas of private telecommunications and discrete transportation of goods across international borders.